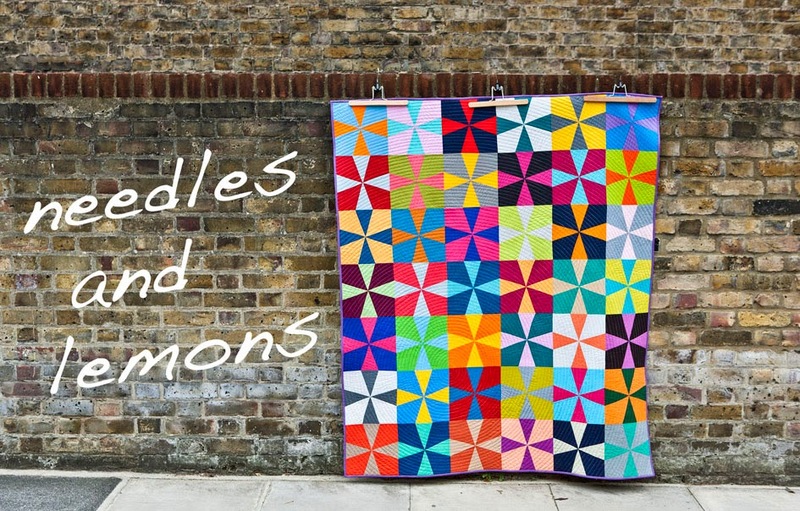 Things have settled back to normal here at needlesandlemons headquarters after Quilt Con and in fact I should be popping in here a bit more regular for a while with posts about quilts in progress and not just finished quilts. I have currently no deadlines for any of the magazines I worked with last year and am free to show what I want. 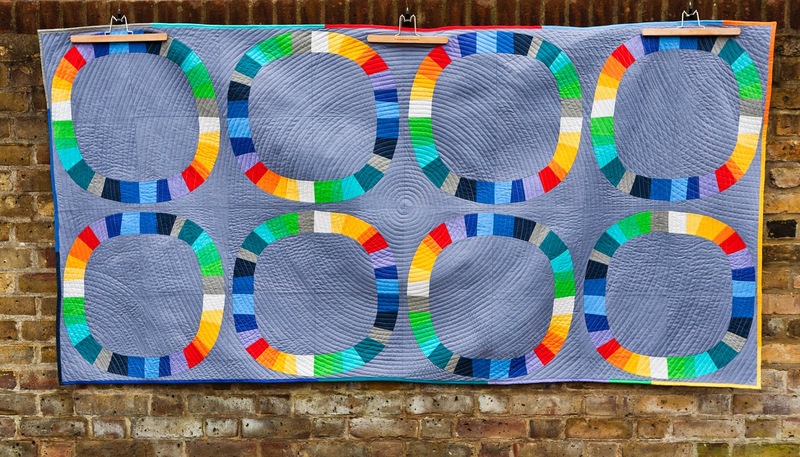 I really love working with LP&Q but there is a small downside to it in that I can't show much of the work I do for them until the issue is out and then it is only the finished quilt. I hope I will work for them again in the future but right now I am a free agent ! Anyhow, here is a picture post of the Single Girl quilt I started here. My client commissioned me to make a quilt with the 'Single Girl' quilt pattern as a single bed quilt for her lovely daughter. A size I have worked with only once before for another client. It's an interesting size as it is long and narrow and this pattern lends itself wonderfully to it. The quilt is 2.20 m x 1.20 m which is a great size for a single bed. The fabric used are all Kona colours and the background colour is Kona Slate which is a bluish grey that is fresh and sets of the bright colours of the rings. I quilted in my favourite quilting pattern, the continuous circle of course and added on two corners a partial circle for a bit of interest. The backing fabric is the 'Palette in spakle' print from Carrie Bloomsten's paint collection which I think is a great print for a young girl. 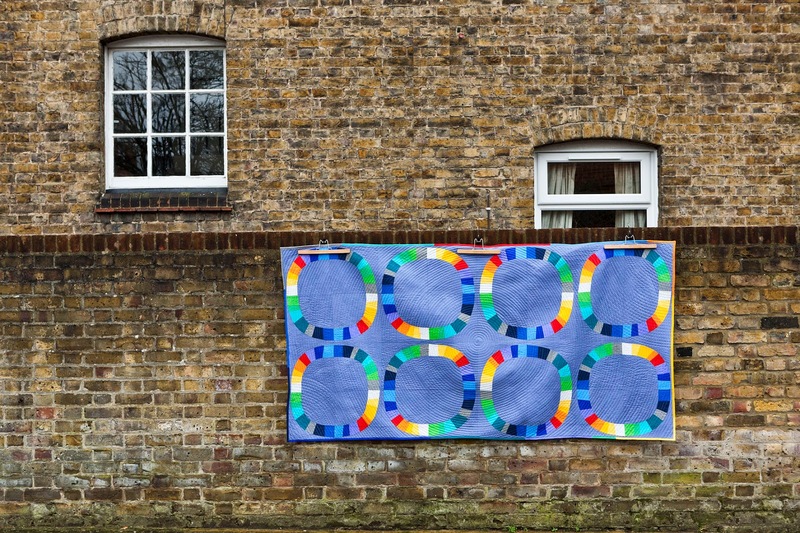 I make no secret that this quilt pattern by Denyse Schmidt is probably my favourite of all times as it is utterly modern and contemporary and I again loved making this quilt and collaborating with my client on fabric and colour choices. It was fun and she and I are both happy with the result. Isn't that what's all about ? I love the SIngle Girl pattern and never tried it, just admire for a distance! It works beautifully with the circular spiral quilting. I adore this pattern! I'm, very slowly, working my way up to a king size for our bed. I'm at the point of "hacking" the arches into a paper piecing template to speed things up. Yours looks so pretty in solids though I feel some planning coming on for cushions! This quilt is wonderful. 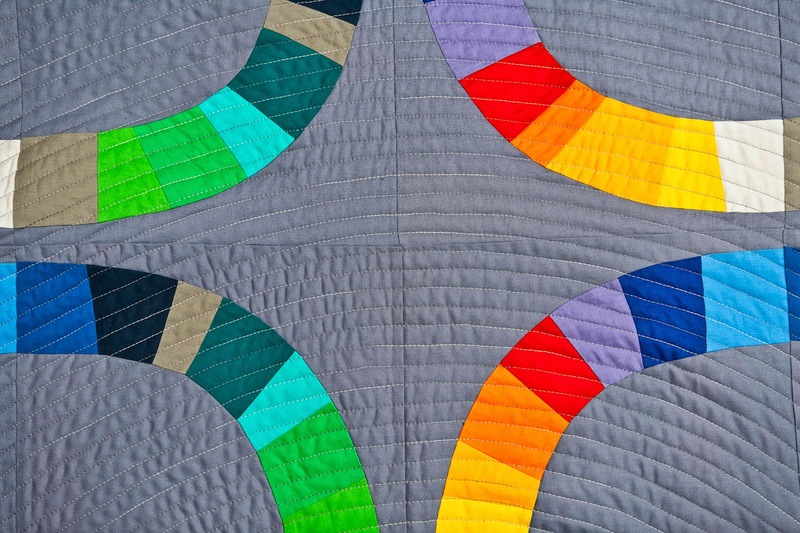 I really love the solid rainbows in this version, the whole quilt is so striking. Goodness! This is downright amazing! I love this so much! It is gorgeous! I love how you turned the ring with each block. It really gives the illusion of movement, especially when I focus in on the yellow/red sections. 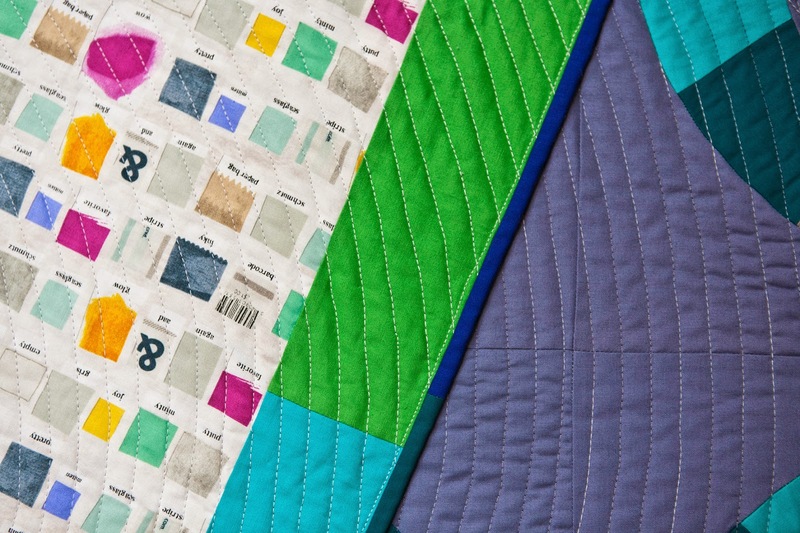 The quilting design goes perfect with this pattern! Love the size...perfect for the foot of the bed then pull up when a little chilly! The quilt is lovely, the single girl quilt is still on my bucket list. I'm a little confused though, is this just a runner for the end of the bed? Or are single beds where you are exceptionally narrow or a different bed than I'm thinking of? My son has a grandma made one that is 60" x 90" and when I finish(hopefully THIS year) the one I'm making For him it will be around 70" wide. 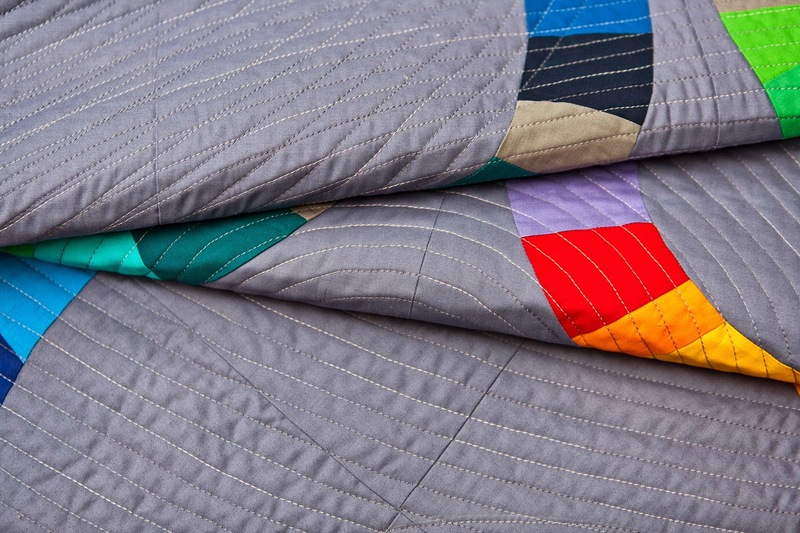 The quilt is made for a single bed size. A single bed is usually around 40 to 43" x 80". The quilt is a little longer and wider and is not meant as a runner although one could certainly use it as such for a larger bed.